Need a super simple dinner idea? 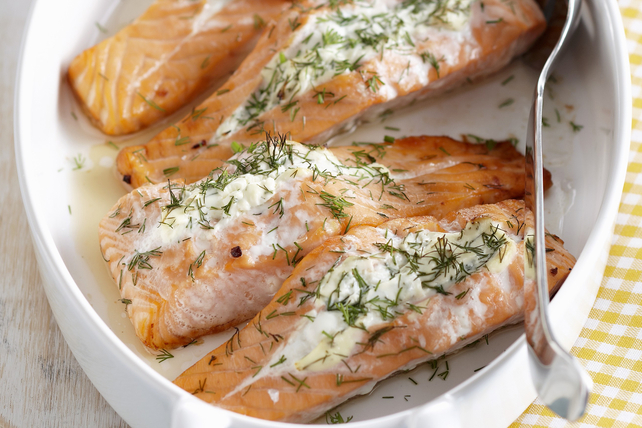 Our Roasted Salmon with Herbed Cream Cheese is a delicious weeknight dinner recipe. With only 3 ingredients - it doesn't get much easier than this! Mix cream cheese spread and dill until blended. Cut horizontal slit into one side of each fish fillet to within 1/2 inch of ends to make pocket, being careful to not cut all the way through to opposite side of fillet. Fill slits with cream cheese mixture; place, filled sides up, in shallow baking dish sprayed with cooking spray. Bake 10 to 12 min. or until fish flakes easily with fork. Serve with cooked baby potatoes and a tossed mixed green salad.